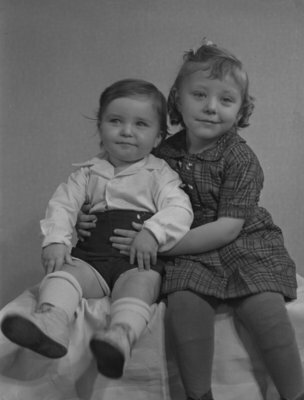 A black and white large format negative of the Brown children taken on December 9, 1946. In this view a young girl has her hands around her younger brother. The negative envelope refers to the children as Roy Brown's. Brown Children, December 6, 1946, Marjorie Ruddy. Whitby Archives A2013_040_619.